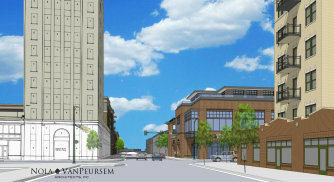 A new mixed-use development will soon begin taking shape in a vacant corner lot in the heart of downtown Huntsville. Huntsville real estate firm Crunkleton & Associates said a groundbreaking ceremony will be held this fall for 225 Holmes, a 32,000-square-foot retail and office project across the street from Below the Radar, Old Town Beer Exchange and Sip, which is currently under construction. Crunkleton spokeswoman Kadie Pangburn said the primary tenant at 225 Holmes will be revealed later this year. The development could potentially have a third-floor rooftop patio with additional restaurant or event space. “Early stage estimates project approximately $7 to $10 million dollars will be invested into the development,” she told AL.com. Eric St. John and Anusha Alapati with Crunkleton Commercial Real Estate Group are the lead leasing brokers, while Nola | VanPeursem will serve as head architects for the development, which should be complete by spring 2018. St. John said the city center needs more office space, adding 225 Holmes will increase the downtown business and daytime workforce by 150-200 jobs. “That’s 150-200 more people coming downtown, every day, to potentially patronize the surrounding businesses and boost the downtown economy,” he said. Chad Emerson, CEO of Downtown Huntsville Inc., said DHI is seeing greater interest in businesses moving downtown because of loft and retail development, as well as nearby amenities like Monte Sano Mountain and Big Spring Park. There are currently three major projects underway in downtown: CityCentre at Big Spring, The Avenue and The Garage at Clinton Row. Adding 225 Holmes to the mix “continues a trend of increased investment in downtown every year,” Emerson said.